It has been rumoured for a while that we would see the Lumia 830 at IFA on September 4th, along with a 730. Along with what specs the phone will have, there was also a few rumours flying around as to what sort of branding the phone would have after the acquisition of Nokia by Microsoft. 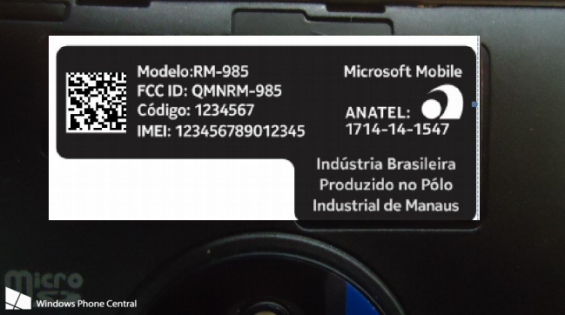 That question at least has been answered in a leak through Brazil’s Anatel certification system and the answer is Microsoft Mobile. The picture shows the model number of RM-985 and the Microsoft Mobile branding, although the phone retains the Nokia name on the front. The sticker lies under a removal back cover with a microSD card slot just next to the camera module which looks similar to that in the 930 and 1020 indicating Pureview optics. Other pictures show the micro USB charging socket on the top next to the 3.5mm headphone socket. Also seen in the pictures are a side camera button which would back up the Pureview rumours after Microsoft stated that future Lumias wouldn’t have a hardware camera button unless they had Pureview. The phone measures 139.4 x 70.7 x 8.5 mm which is a little thinner than its predecessor the 820. Full details should be announced at IFA in Berlin in a few weeks time.